Leonard Cohen is my home boy. I refer him affectionately as L.C. or simply Leonard. He’s at once a living legend and an unknown mystery. Some people have never heard of him but they have undoubtedly heard his songs. In Siberia, while volunteering at Lake Baikal, I was playing guitar around the camp fire and started playing Hallelujah a la Jeff Buckley. Most of these Russians began singing along, at least with the chorus, thought I admit it’s pretty straight forward. I asked if they knew who’s song this is originally considering that its one of the most covered songs in music history. No one knew. 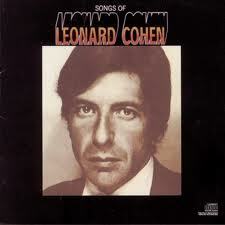 I said with pride that it’s my hometown hero, Leonard Cohen. The next time I would see him is in a CouchSurfing search. A young lady listed him as a musical preference. It was easy enough to make a connection with her based on Leonard alone. She was from the Baltics and it was her parents who introduced him to her. At this time I also noticed that I was arriving in Tallinn, Riga and Vilnius a few days after the touring Lady Gaga had already left town. And then I arrived in Bucharest. There was Leonard in his unmistakable silhouette, a plain black suit and his signature fedora hat tilted with his head down. These posters were pasted all over the city. I asked my friends if they knew him. They did but they weren’t about to go see his concert. I try not to tell people what to do – we all have our own preferences – but I was telling them that they should. This great man is on what is probably his last world tour. It’s historic. And I was thrilled that I got to see him for the unofficial opening of the Montreal Jazz Festival in June 2008. 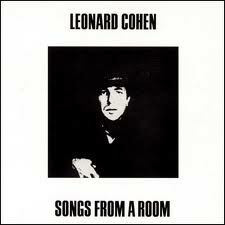 The way Leonard can still fingerpick your soul into a trance with his guitar and completely capture, captivate you. It is nothing shy of mystical. It is with his fingerpicking patterns that accompanied his poems that seep with blood, tears and blisters that first enchanted me. His work ethic is well known and is a great inspiration for me as a writer. The way his words flow – every word enthralled with meaning and decisiveness. How emotional. And his dedicated professionalism. And he’s still at it, my hometown hero, a perfect role model. He’s 77 and just released a new album this year which topped the charts worldwide! Old Ideas. and Songs From a Room. I’m more than just a writer. As you may have noticed, I’m a traveler. And these songs are of a traveling spirit, if not in the world than at least within. These songs have accompanied me on countless train rides, as well as inside my mind as I stared blankly out the bus window. I’ve taken city strolls and countryside walks with Leonard all over the world. With so many themes and topics to reflect on, Leonard helps with understanding oneself, others, and this world, this life, and our relationship with it all. Here are a few stand outs for me based on traveling. Oh the wind, the wind is blowing. Through the graves the wind is blowing. Freedom soon will come. And it will come from the shadows. I use to think that I was some kind of gypsy boy. Your master took you traveling, well at least that’s what he said. And now do you come back to bring your prisoner wine and bread. Stranger Song – One of my all time favorite youtube treasures. You try the handle of the road. It opens. Do not be afraid. It’s you my love it’s you who are the stranger. Then taking from his wallet an old schedule of trains he says, I told you when I came I was a stranger. We are so small between the stars so large against the sky. And lost among the subway crowds I try to catch your eye. And of course of desire and belonging. And you want to travel with her. And you want to travel blind. And you know you can trust her because she touched your perfect body with her mind. These are brief interpretations based primarily on the lyrics I highlight. I dare not have the nerve for a full scale analysis. All this to say that my boy L.C. is one of my favorite travel companions. 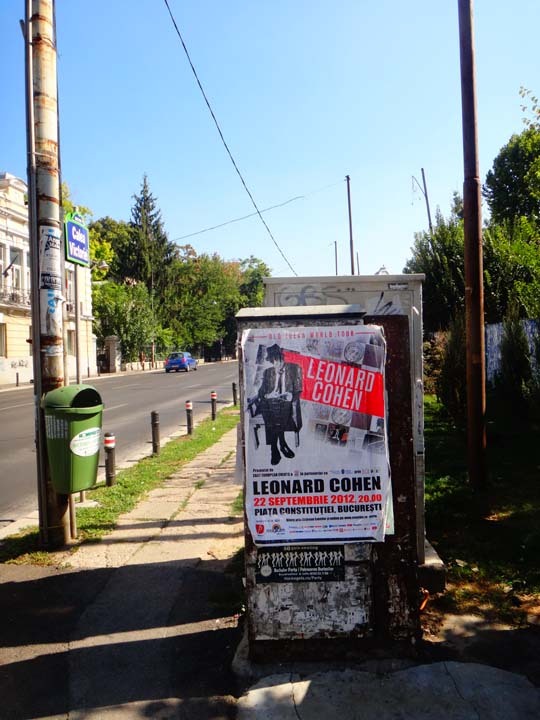 Though I was too early for him in Bucharest, I think that it says something about me that I’m too late for the likes of young Lady Gaga, while being much too early, perhaps respectfully so, for the legend, Leonard Cohen.